the sky is rainbow. the ground is lava. a turtle is 15 foot in front of the ground. the pipe is large. the turtle is very big. 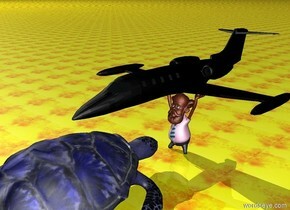 a green hat is above the turtle. the hat is -0.8 foot in front of the turtle. the hat is -0.45 foot above the turtle. 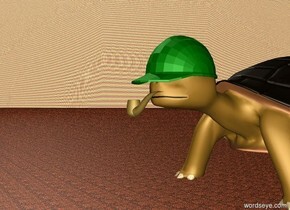 a pipe is in front of the turtle. the pipe is -0.8 foot above the turtle. Giant clear glass. One tiny snake is inside the glass. Four giant hammers. The hammers are 1 foot to the left of the glass and 2 feet apart. Four large bananas 1 foot to the right of the glass. The bananas are 1 foot apart. A huge crown on the gigantic apple. The apple is 0.8 feet to the left of the hammers. 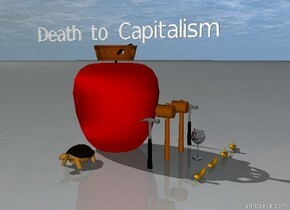 "Death to Capitalism" above the apple. A very large turtle in front of the apple.